Cartersville and Plant Bowen | Just Shooting Memories! I was hoping to get at least some photos from my sunrise trip to the top of Pine Mountain, but that did not happen. 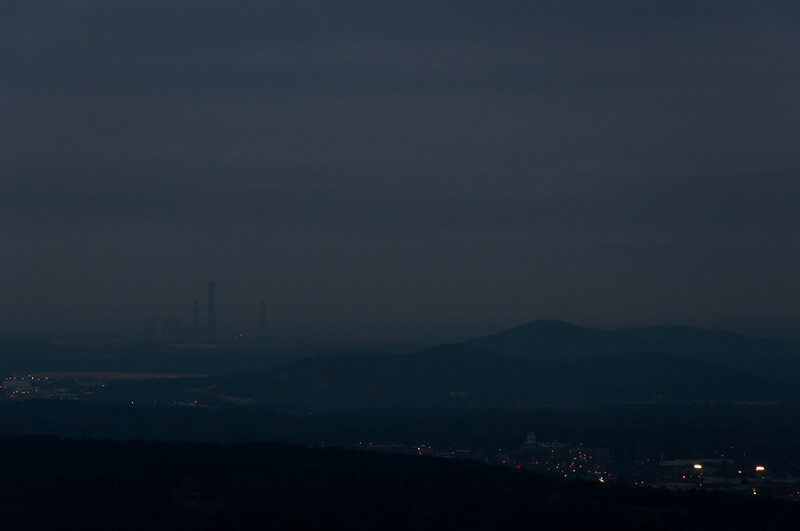 I did get some predawn, overcast shots of Cartersville and Plant Bowen. Click on the photo and view it large. Above the lights in the bottom right, you can see the Bartow County Courthouse in the distance, you can see the smoke stacks from Georgia Power’s Plant Bowen. From where I took this photo, it is about 3 miles to the courthouse and near 11 miles from Plant Bowen. Wow, when I first viewed this in the email subscription, I couldn’t see much, but clicking on the image (taking you to the larger view) shows so much more. This would be a great spot for a time exposure, as the sun light plays on the hills and power plant stacks.